Today begins a series of blog posts about taking good care of yourself as you prepare for the holidays. And read all the way to the end to register for a free workshop on this topic! The first step is to be more mindful. If you are aware of what could get in the way or create more stress and overwhelm, you are more likely to respond to things rather than to react. One of the ways I suggest becoming more mindful is to take a few moments to think about what you’d like your intention for the season to be. Your intention is a statement or series of statements about how you’d like to feel while you are gathering with friends and family or engaging in holiday events. You can also incorporate how you would like others to feel in your intentions. 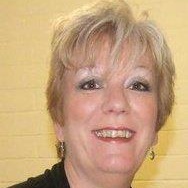 For example, you may want to feel joyful, relaxed and engaged with others. Perhaps you’d like your presence with your family to be felt as though you are connected to them, listening to them and enjoying your time with them. Maybe you’d like to be responsive to your needs and to the needs of others by giving and receiving love and joy. Take a few moments to think about what your intention is this holiday season. At the end of 2017, what would you like to say about your holiday time? Now, take a moment to cull your statement down to one main word. Maybe it’s Joy. Perhaps you want to feel Present. Or Connected. Write that word down on an index card or a piece of paper and put it somewhere you’ll see it every day. Maybe on your bathroom mirror or your refrigerator. Each time you see your intention, it will help you stay connected to it – to remember that this is the way you have decided you want to feel. For extra help in this area, journal for a few moments each day and think of three ways in which you could realize that intention. Or at the end of each day, you may want to reflect back and think of ways in which you felt your word come to life that day and plan a few ways for the day ahead. I’d love to hear what intentions you’ve created! Just comment on this blog post or on Facebook and let me know what you want this holiday season. 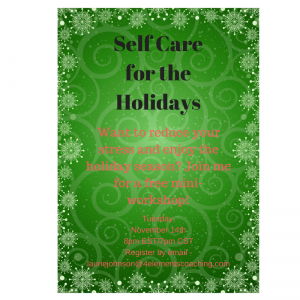 To help you with more self care tips for the holiday season, I’m hosting a free mini-workshop on Tuesday, November 14th at 8pm EST/7pm CST. This workshop will be delivered via conference call so you’ll need to register to get the call-in details. You can register by emailing me at lauriejohnson@4elementscoaching.com with Register Me in the subject line. Or go to our Contact Us page here on the website and put Self Care for the Holidays in the subject line and Register Me in the message.